Remember what I said about not making homemade granola anymore because I love them way too much? Well, apparently breaking my own promise a few weeks ago with Baked's granola opens the door to one slippery slope. I can't get granola out of my mind. Reading about them in other food blogs just make me want to make a batch more and more. Last night, I gave in to temptation at last. I remember reading the recipe from David Lebovitz a while ago and marvelled at the judicious use of oil in the recipe. 2 tablespoons for 10 cups of dry ingredients? Can it be possible? As it turns out, it is much more than possible. Using unsweetened fruit puree, the toasted oats take on a caramel sheen not unlike praline. That whisper-thin caramel coating also makes the cereal crunchy like you wouldn't believe. Surprisingly though, it doesn't taste all that sweet. It's cereal, not dessert. Ridiculously adictive, but it's cereal. I think the use of sesame seeds is pretty brilliant. It reminds me of caramelized bananas coated in sesame that you get at Northern Chinese restaurants...that fun dessert which you dunk every piece into an ice bath to get a crispy crunchy caramel coating. If you still need another reason to make this granola, this is a great recipe to use up that over-ripe banana sitting all alone on the counter that nobody wants to touch. Preheat oven to 300F. Line two half sheet pans (11x17) with silicone liner. Coarsely chop almonds in a food processor by using the pause button. Empty into a very large mixing bowl to combine with oats, sunflower seeds, sesame seeds, brown sugar, cinnamon, ginger, and salt. Puree the bananas in the food processor until very smooth. In a measuring cup, combine the remaining ingredients and microwave on high for about 45 seconds to warm. Stir to combine. Pour the liquid ingredients into the dry ingredients and stir until moisten. Divide into the two prepared pans and spread evenly with an offset spatula. Bake for 45-55 minutes, stirring every 10 minutes and rotate the pans to ensure even browning. 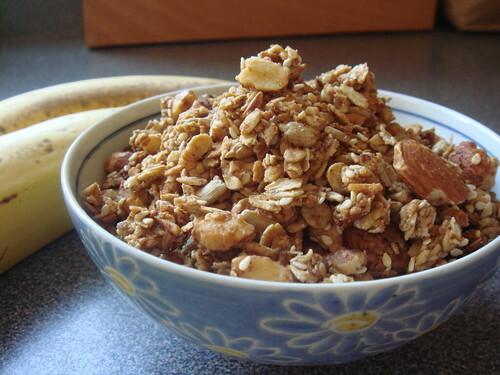 The granola is done when it is an even golden brown colour. Remove from oven and give it a good stir. It will still be a little soft but will crisp up as it cools. Once it's completely cooled, store in airtight container. Although there is still a chill in the air here in Canada, spring has arrived by the unmistakable signs of tulips and budding leaves around us. My cravings for braises and rib-sticking comfort food have taken a backseat and I want something lighter for my meals. 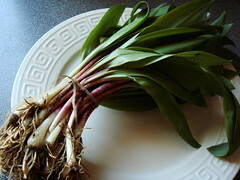 My previous CSA share contained a huge bunch of ramps which I gently sauteed and enjoyed with softly scrambled eggs. It was officially my kick-off meal for spring. In a perfect world, I would follow up with meals of asparagus and morels and fiddleheads and spring garlic...alas, my world is not that perfect. My racing schedule brought me to Austin, Texas last weekend so last week I scrambled to clean my fridge of all perishables. The few days between returning home and picking up another share from my CSA, I had an interesting dilemma on my hand. How to make a meal worthy of spring fever from mostly pantry staples? This pasta dish is my answer. 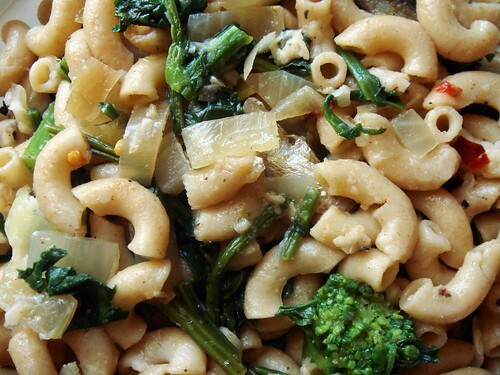 Whole wheat macaroni tossed with Brisling sardines, grated Parmigiano-Reggiano, and chopped rapini lightly sauteed in olive oil with onions and garlics. It is light yet delivers big flavour. I am a huge fan of canned sardines packed in olive oil. These oily little fish are so delicious and tremendously nutritious. I think it's too bad that most people find them too fishy. In this particular dish, they pair so well with the slightly bitter greens and the cheese adds oomphs without too much richness. In a large sauteuse, bring 5 cups of water to boil and salt generously. Stir in dried pasta and return to boil. Close the lid and turn off heat. I like to take this time to chop and prep all my other ingredients and the pasta will be cooked when I'm done, approx 10-15 minutes. Alternatively, use your favourite way to cook pasta. Drain and set aside. Wipe your pan dry and heat 1/2 tbsp olive oil on high. Cook the onion and garlic until fragrant. Toss in the rapini stems and continue to cook until softened. Add the chopped rapini leaves and crushed red pepper flakes. Season with salt and pepper. Be lighthanded with the salt because the sardines and cheese will add plenty of saltiness. Working quickly, toss in cooked pasta, sardines (don't worry too much about draining the olive oil), and grated cheese. Adjust seasoning and serve immediately. This is one of my "travel" recipes which requires only the bare minimal kitchen essentials to make. The ingredients and equipments are standard in most kitchens so it is something I can easily bake in other people's homes for an impromptu dessert. 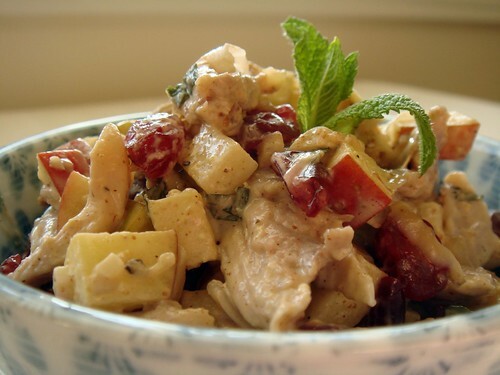 This recipe is highly adaptable with the combination of fruits (fresh or dried), nuts, and spices. Just use whatever in season or available. I have made this using chopped apples/almonds/nutmeg though I think blueberries/hazelnut/lemon zest would be a fantastic combination as well. Or how about prunes/walnut/orange zest? I can imagine mango/coconut/macadamia/lime to be another winning flavour too. The possibilities are endless. Preheat oven to 350F. Grease or line a 9x13 pan with parchment paper. In a large mixing bowl, stir together flour, granulated sugar, salt, 1/2 tsp of cinnamon, and brown sugar. Work in the oil until mixture is crumbly. To make the crumble topping, take 3/4 cup of the flour mixture into a small mixing bowl. Stir in remaining 1 tsp cinnamon and chopped nuts. Set aside. To make the cake batter, stir in baking soda and baking powder into the flour mixture. Beat in buttermilk and egg until batter is smooth. Fold in dried apricot. Pour cake batter into prepared baking pan. Top with crumble topping and gently press to even thickness. Bake for 35 minutes or until toothpick comes out clean. Cool for 10-15 minutes before cutting. Growing up in Hong Kong, Horlicks and Ovaltine used to be my default breakfast drinks. You see, caffeine is for grown-ups so of course no tea nor coffee for us kids. In an attempt to make these malted milk drinks wholesome, my mom used to fortify them with heaping spoonfuls of skim milk powder. When I got to the bottom of my mug, more often than not I would find lumps of skim milk mingled with lumps of malt. Needless to say, the lumps of malt were the good part but I choked down the skim milk lumps nonetheless. That was my morning ritual for a better part of my childhood. I am fond of the taste of malt and that love naturally extends to other malt flavour candies. Maltesers has always been a treat. During Chinese New Year, families would exchange boxes of chocolates and candies when visiting each other (think hostess gift). Regifting is not out of the question of course. At the end of the evening, my parents would have a short family meeting with me and my little brother and we got to vote on which boxes to keep and which boxes to continue circulation. Ferroro Rocher? Keeper. Dad's favourite. Maltesers? Voting was entirely redundant because it was my Mom's favourite candies and of course Mom always had the last word in these sorts of decisions. I used to think that Maltesers were a bit plain compared to my Orange Club. Surely milk chocolate balls surrounding a light honeycomb centre of malt is not as exciting as orange cream filled biscuit covered in thick layer of milk chocolate! (for North American readers, Whoppers is the more popular version here) As I got older, I started to appreciate malt more and more (ahem, that has nothing to do with beer). I love the warm toasty flavour. I love how its mellow taste matches so well with milk chocolate. In fact, whenever I see malt being used in a dessert menu, it became my first choice. Perhaps I am becoming more like my Mom? It's too bad that I don't use malt often enough at my own kitchen. When I saw not one, but four recipes calling for malt in Baked: New Frontiers In Baking, I knew I found kindred spirits. This Brewer's Blondies is a standard blondies flavoured with a double whammy of malted milk powder and crushed milk chocolate malt balls. How can it be anything but awesome in my books? Preheat oven to 350F. Line a 9x13 pan with parchment, set aside. In a bowl, whisk together flour, baking powder, salt, and malted milk powder. In the bowl of a standmixer, beat together butter and brown sugar at medium speed using the paddle attachment for about 3 minutes until fluffy. Add vanilla and eggs one by one, ensuring egg is fully incorporated before adding the second one. Add dry ingredients into the butter mixture and beat at slow speed until it's barely combined. Do not over mix. Add malt ball candies, chocolate chips, and walnuts. Mix for about 10 seconds until they are distributed in the batter. It will be very thick. Spread the batter into the prepared pan and smooth it with an offset spatula. Survey your batter and if you notice there are obvious spots with low concentration of goodies (i.e. all the chocolates and nuts), don't be afraid to press in a few more pieces. I know I would feel cheated if I pick a piece with just one chocolate chip. Bake for 25-30 minutes until top is golden and toothpick insert into the centre comes out clean. Cool on wire rack until completely cooled. 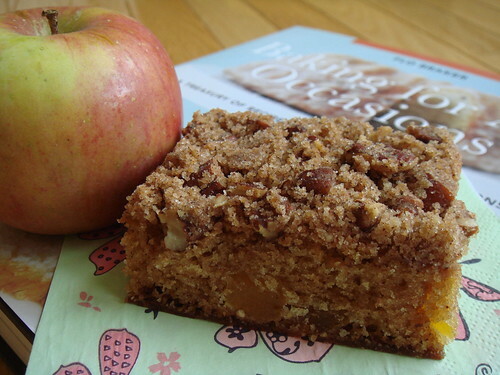 With the help of the parchment paper, lift the bar from the pan onto a cutting board. Cut into 24 pieces and serve. The guys at Baked recommend that these bars be served warm (about 15 seconds in the microwave would do) with a scoop of vanilla ice-cream. I think that would be a great dessert for a barbeque. My preference goes to cutting a piece into four 1" cubes and eat them chilled like bonbon. Chocolate enrobing optional. Now that's decadence! A trend for much of the dishes I've been cooking recently is developing core cooking skills. I remember hosting my first Thanksgiving dinner years ago and the idea of roasting a turkey almost caused me to call the whole thing off. Drawing from my background in pastry and dessert, I easily saw the savory/sweet parallel for most of the dishes. Cranberry sauce is cooking a fruit compote. Dressing is simply a savory bread pudding. Mashed potatoes is similar to chestnut puree. Apple pie is the first thing we baked in Introduction to Baking. But roasted turkey? Aside from a bigger, more troublesome version of a roasted chicken, there is no equivalent from the sweeter side of the kitchen. Until last night, I have never roasted a chicken before. It boggles my mind that I did not bat an eye when making complicated plated desserts yet handling a raw whole chicken was more than difficult. My quest to become a more competent homecook has taken me to many delicious stops along the way. Let's take a look at what I learned recently. 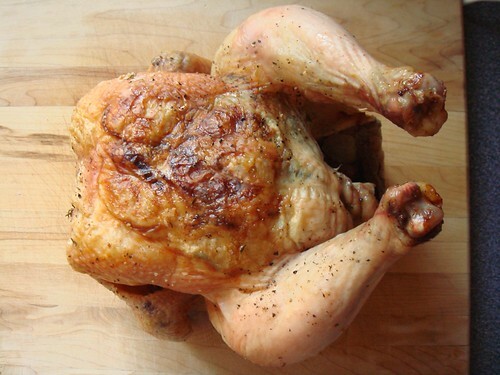 Roast Chicken: Roasting a chicken is probably something a cooking 101 course would teach. Anybody can throw a chicken into the oven. It's such a basic skill yet to achieve crispy skin and juicy meat, it can get a little elusive. Just do a search on "perfect roast chicken" and you would be amazed at all the tips and tricks available. For me, the biggest hurdle was handling a raw whole bird. The very tactile experience of cleaning, patting dry, seasoning, massaging butter between the skin and meat, and trussing was really more intimate than I would like. However, there is something grown-up and traditional about roasting a chicken for Sunday supper. My first foray into this essential cooking skill involved unconventional use of a tube pan, typically reserved for making angel food cake or chiffon cake. It was a winning recipe on the food52 project. It is a riff on the grilling classic beer can chicken. Since I neither have a grill nor cans of beer lying around, getting more use out of my tube pan was immensely appealing. Another big plus? There is no need to flip the bird (badabum!) during roasting to ensure an all-over crispy skin! I roasted a 4lb White Rock chicken from my CSA with butter, shallots, fresh thyme, salt, and pepper. I was going to brush the skin with some maple syrup to give it a nice mahogany hue but I forgot. Well, I didn't miss it. The chicken turned out so tender and juicy with crispy skin. It was a huge success as far as first attempt goes. Speaking of roasting a huge piece of meat, making roast beef for the first time was also good and a lot less nerve wrecking. Spending a lot more time in the kitchen in the last few months, I begin to notice changes to the way I cook. I've always been more comfortable with baking and baking requires a lot of planning and precision. I have always rely heavily on recipes and that extends to cooking savory food. Recently, I am more confident with my cooking. With that confidence, cooking is now more intuitive and I can improvise delicious meals based on ingredients I have on hand. Dinner last night was a good example. The sunchokes and lettuce from my CSA share earlier this week were both begging to be used. A main course salad would be a logical choice. I surveyed my pantry and found the black beluga lentils I bought last week at Whole Foods. Lentils are great for a quick meal since they don't require pre-planning (i.e. overnight soaking). These glistening little pearls do not go mushy when cooked, pretty and practical for salads! Having a well-stocked pantry is key to help me improvise dishes on the spot. 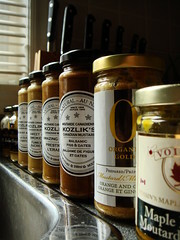 A nice selection of mustard, vinegar, oil, herbs, nuts, and dried fruit can turn many ordinary dishes into extraordinary. I love salads but have little tolerence for spicy food. That is the reason why at last count, I have 8 different types of mustards but only one jar of hot sauce (boring standard Tabasco). Part of the fun is to customize your pantry to suit your style of cooking. Roasted sunchokes and black beluga lentils are tossed together with toasty almonds, sweet tart dried apricots, and refreshing dill. I dressed the salad with a simple vinaigrette of olive oil, red wine vinegar, orange ginger mustard, and fig orange jam for a little added sweetness. Every delicious and healthy spoonful is enjoyed with first spring lettuce of the season. This is what I would consider as "chick food". Surprise surprise, it received rave review from little brother. I guess if something is delicious, it knows no gender boundary. Like most of my main course salads, this one is vegan and gluten-free. Preheat oven to 400F. Fill a large mixing bowl with cold water. Peel the sunchokes and immediately drop them into the bowl of water to prevent oxidization. Don't worry if you cannot get the peel completely removed in all the nooks and crannies. Dice the sunchokes into 1.5cm pieces. Toss the diced sunchokes with 1 tbsp olive oil, season with salt and pepper. Spread them, single layer, in a pan and roast for 30-40 minutes until fork tender. Set aside. While the sunchokes are roasting, bring 3 cups of water to boil in a small saucepan. Put the lentils and bay leaf into the pan and return to boil. Turn the heat down to a simmer and cook for 30 minutes until soft. Drain and set aside. Discard bay leaf. Set the oven to 350F. Spread the almonds in a small baking pan. Toast them for 7-8 minutes until fragrant. Roughly chop them when they're cool enough to handle. Make the vinaigrette: in a small bowl, whisk together 2 tbsp olive oil, vinegar, mustard, and jam until smooth. Adjust seasoning if necessary. 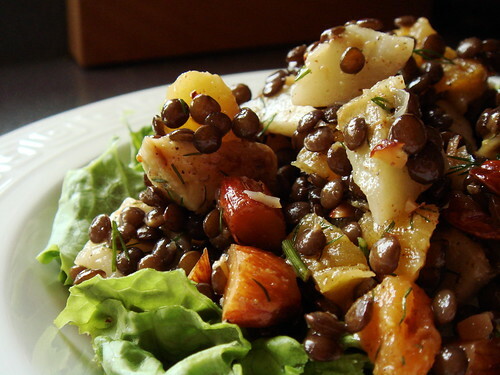 In a large mixing bowl, toss together roasted sunchoke, lentils, apricots, almonds, and dill with the vinaigrette. Season with salt and pepper if necessary. At this point, you can store the salad in the fridge overnight. 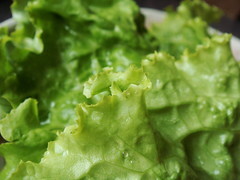 To serve, divide lettuce pieces among three serving plates and generously top each with the dressed salad. Of course, I have broadened my taste and baking repertoire since. Vegetable quick breads and loaf cakes now emerge from my home oven on a regular basis perfuming my whole house with their mix of sweet spices. When you mix together cinnamon, nutmeg, ginger, cloves, cardommon, allspice, only good things can happen. Oh right, and the natural sweetness from the vegetable doesn't hurt either. If I try really hard, I can even convince myself that these are good-for-you healthy treats (not!). 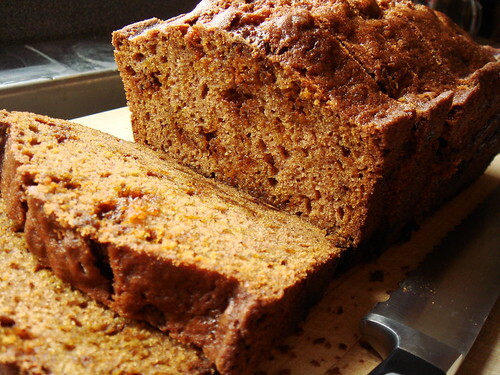 For me though, the most alluring quality of these quick bread is how easy they are. A simple mix of wet ingredients into dry ingredients for an active kitchen time of 15 minute tops and I will be rewarded with moist loaf of cake perfect for breakfast or tea. I can be quite lazy sometimes. I adapted this recipe from Baked: New Frontiers in Baking. The original recipe yields two loaves which is a bit much for me to commit to. It also calls for semi-sweet chocolate chips which I replaced with cinnamon chips for fun. 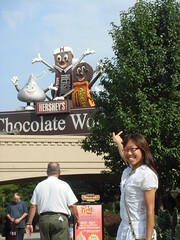 When I visited Hershey's Chocolate World in Pennsylvania, I stocked up on many of their baking goodies. Of course I came home and had no idea what to do with them. Turns out the cinnamon chips partner well with this mildly spicy cake. Not only did the long baking time developed a nice crust on the outside of the cake, it also melted the cinnamon chips into tiny bursts of cinnamon sweetness. This cake is moist and it keeps well at room temperature for days of enjoyment. Preheat oven to 350F and set a rack to middle of oven. Grease and flour a 9x5x3 loaf pan, set aside. In a large mixing bowl, whisk together flour, spices, baking soda, and salt. In another large mixing bowl, whisk together pumpkin puree and oil until smooth. Stir in sugar and vanilla extract. Whisk in the eggs one by one until incorporated. Lastly, whisk in water until you have a smooth mixture. Pour wet ingredients into dry ingredients. Gently fold and stir until just barely combine (a few lumps is okay). Do not overmix. Fold in cinnamon chips. Pour batter into prepared baking pan. Tap the filled pan against the counter top to knock out potential air bubbles. Smooth top. Bake for one hour 15 minutes to one hour 30 minutes. Rotate pan at the half way mark to ensure even browning. The cake is done when toothpick insert into the middle of the cake comes out clean. Cool on wire rack for 15 minutes. Unmold the cake and continue cooling right side up. For the neatest slices, you have to wait until cake is completely cooled before cutting. If you're impatient, just dig in right away. Store in airtight container at room temperature for up to 3 days. The flavour actually melds better after the first 24 hours, if you can wait that long. 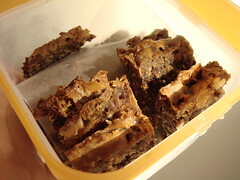 Through the years, I've baked my fair share of brownies (pecan or cheesecake anyone?) and blondies (rocky ledge! muffin trompe l'oeil! butterscotch!) and lemon bars. Bar cookies are the low maintenance, streamlined cousin of cookies...assuming you're not keen on cutting them to exact same size with crisp 90-agree angle corners. They are so easy for spur-of-the-moment baking. I'm pretty confident that I attempted most of the classics at one point or another so when I see one that I have not tried yet, my curiosity is piqued. I mentioned earlier that I'm baking my way through the Baked: New Frontiers in Baking cookbook. 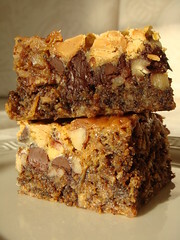 The Baked Bar caught my attention early on because it is Baked's version of the bake sale classic known by many names. You probably ran into it before as Hello Dolly, Seven Layers, or Magic Bar? Yeah, that one. 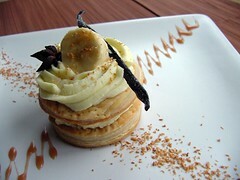 The one so decadent and so loaded with goodies that your dentist would frown at the mere mention of its name. 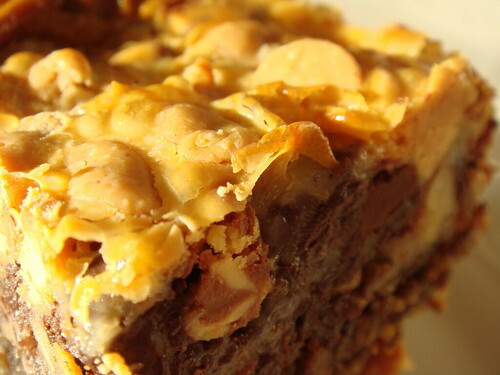 Stripped down to the basics, this bar cookie is simply layering butter, graham cracker crumbs, coconut, nuts, and chocolate in a pan, drizzled with condensed milk, and bake to the point of caramelization. The premise opens up much room for improvisation and creativity. Unlike baking a proper cake or a batch of cookies, there's no fine balance of chemical reaction at play here. 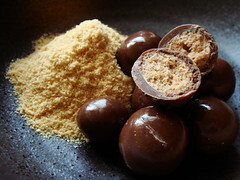 Just a bunch of delicious ingredients bind together by caramelized condensed milk. I like the approach of the Baked recipe. It blindbakes the crumb coconut crust to give the bar some structure. Also, the shredded coconut and nuts are toasted separately to release their full flavour before incorporating into the bar. The key lies in attention to details. I adapted the recipe to ingredients I have at home and I encourage you do the same too. The success of this recipe lies in your choice of ingredients. Personally, I think the dark chocolate is the most important player. This bar is a sweet treat, no question about it. Using dark chocolate with cocoa content between 60-75% would give it some character and temper the sweetness. I didn't expect to like this bar as my taste leans toward more restraint. However, just like the recipe promises, it is a great balance of chewy and gooey. Long baking time in the oven renders the condensed milk into shades of deep golden brown, redolence of butterscotch or toffee. 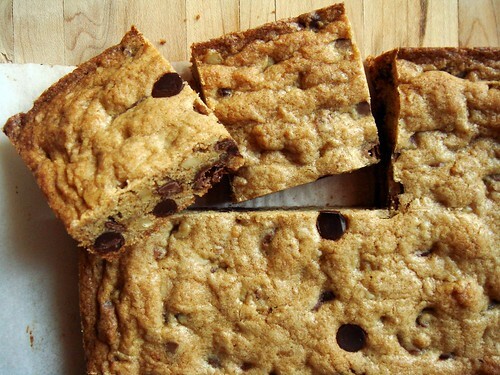 Enjoy this totally over-the-top treat for what it is...a rich almost-candy-like bar cookie. Diet food, it is not. Preheat oven to 300F. Line a 9x13 baking pan with parchment paper. Spread shredded coconut on prepared baking pan. Baking for 7-10 minutes, stir, and bake for another 3 minutes until golden. Put toasted coconut into a large mixing bowl. Spread pecan halves on the same baking pan and toast for 7-9 minutes until fragrant. Chop into coarse pieces and set aside to cool. Toss toasted coconut with graham cracker crumbs and chocolate cookie crumbs. Work in the melted butter until moisten. Empty into the same baking pan and press with fingers or bottom of measuring cup until you have a flat compact layer. Bake crumb crust for 15 minutes until slightly hardened. Set aside on a cooling rack to cool completely. Increase oven temperature to 325F. Now comes the fun part! Spread the ingredients evenly over the crust in the following order: pecans, dark chocolate, white chocolate, milk chocolate, peanut butter chips. Drizzle evenly with condensed milk. Bake for 30-40 minutes, turning the pan every 10 minutes to ensure even browning. Remove from oven when it's bubbling and golden, perhaps even a little brown around the edges. Cool completely on a wire rack. With the help of the parchment paper, lift the bar from the pan to a cutting board. I like to trim the edges before cutting into 24 squares. Keep the bars in airtight container at room temperature for up to 4 days. As for the trimmings, I like to cut them into bite-size pieces and eat them chilled. Taste like toffee! On second thought, that blog title is just too cute and cliche. The truth is, I came to a realization today that when my kitchen is stocked with good ingredients and homemade basics, putting together a delicious dish can be quick and absolutely effortless. This chicken salad is a classic example. I was brainstorming for ideas to use up a batch of homemade mayonnaise and saw drumsticks on sale at the store. Making a chicken salad seemed almost inevitable at that point. All other ingredients in this recipe are pantry staples. What makes it special is the use of mint to bring out the sweetness of apples. It adds such a refreshing and unexpected touch. My preference is to poach the chicken myself instead of using precooked chicken (supermarket rotisserie anyone?). Poaching is such a gentle way of cooking that getting juicy tender meat is guaranteed. 10 chicken drumsticks yield just over 1lb of dark meat. This cut is easy to poach and debone, not to mention quite reasonably priced. Don't waste the bones either! I like to use them to make a quick stock and freeze it for soupmaking later. I highly recommend that you use a mustard with some kick. I happen to have a bottle of freshly made orange ginger mustard. It worked beautifully with this recipe. 4 tbsp mayonnaise, homemade is preferable! To poach the drumsticks, bring a large pot of water to boil. Put drumsticks into the pot and return to boil. Put the lid on and turn the heat down to low. Simmer for 15 minutes until chicken is just cooked. Remove drumsticks onto a plate and cool until you can handle them. Discard skin and debone. Tear the meat into small bite size pieces and put into a large mixing bowl. Chill until ready to use. In the mean time, I like to return the bones to the pot and simmer with some aromatics such as carrots, onions, celery, and thyme to make a quick stock for other uses. Toss diced apples with vinegar to prevent browning. Put both apples and vinegar into the mixing bowl with the chicken. Add all remaining ingredients to the mixing bowl. Toss until evenly coated with dressing. Adjust seasoning if necessary. This salad tastes great on its own on a bed of lettuce but it also makes great filling for sandwich or wrap. 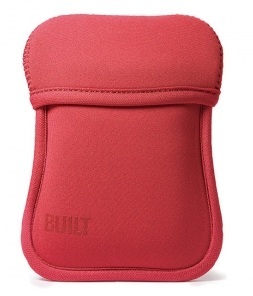 Ever since I got my BUILT NY hoodie camera case in Feb 2009, I swear by it for my compact camera. I love everything about it from the stiff EVA for screen protection to the stretchy neoprene that can accomodate my extra battery. It is cute and incredibly practical. Depending on which pattern you get, it can be a little pricy though. Imagine my surprise when I walked into my local Starbucks today and saw that they are selling a VIA gift pack for $15. The gift pack contains two packages of VIA instant coffee snuggly tucked inside a red hoodie camera case. You can see something similar on the Starbucks website selling for $10 in a different camera case. Considering that the coffee alone will cost me $8, that's a steal!